LATINA CEO with technology experts and resources ready to assist you with your startup or existing business. The startup scene is everywhere. If you notice, it’s happening across the nation with little diversity. Startup funding opportunities for women and minorities, in general, will be even less available, but it doesn’t mean your products and services don’t have a chance. All it means is that you have to be strategic, more resourceful and stay laser focused. 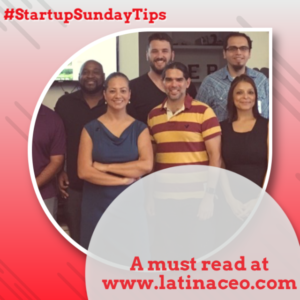 The following are ten #StartupSundayTips from LATINA CEO to help you launch a successful business. We hope these tips help you. There is no cookie cutter start up business plan that fits all! Ultimately good decisions, trial and error, passion and pushing the boundaries lead to success. If you need to speak or meet with experienced small business owners, entrepreneurs’ or technology, marketing, accounting subject matter experts LATINA CEO is ready with available resources to assist you with your startup or existing business today! Contact our team at mailto:contact@latinaceo.com.